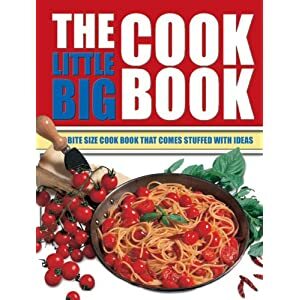 Book description from Amazon: With more than 600 recipes for everything from starters, snacks, and pasta, to desserts, sauces, and preserves, this book is a treasure trove of recipes from around the world. Here you will find recipes for international classics such as Spaghetti with Pesto, Crepes Suzette, Guacamole, Chicken Satay, Sweet and Sour Pork, Houmous, Falafel, Tzatziki, Sachertorte, Apple Strudel, and Tiramisu. This was the second book in the “Little Big” series I bought, after I had the Vegetarian one for a few years. I love the size: small, compact but very thick. There are pictures with every recipe, some expensive ingredients and alot of budget foods–something for everyone. I’ve made the Irish Soda Bread, some of the spaghetti’s and vegetable and focaccias. The recipes are easy to follow, nothing complicated or out of hand. If you can boil water for eggs, you can follow most every recipe here. The recipes are mostly healthful, doesn’t require fatty, high sodium foods. You can easily substitute what you have on hand or at your local store, they are very forgiving. Even though they were written for a European audience, I’m sure they are easily understood by anyone. I would recommend this cute little cookbook to add to your cookbook collection.